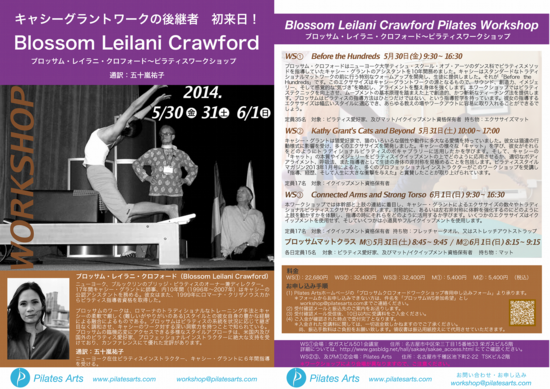 Pilates Workshops with Blossom Leilani Crawford May 30 - June 1, 2014 SAVE THE DATES! 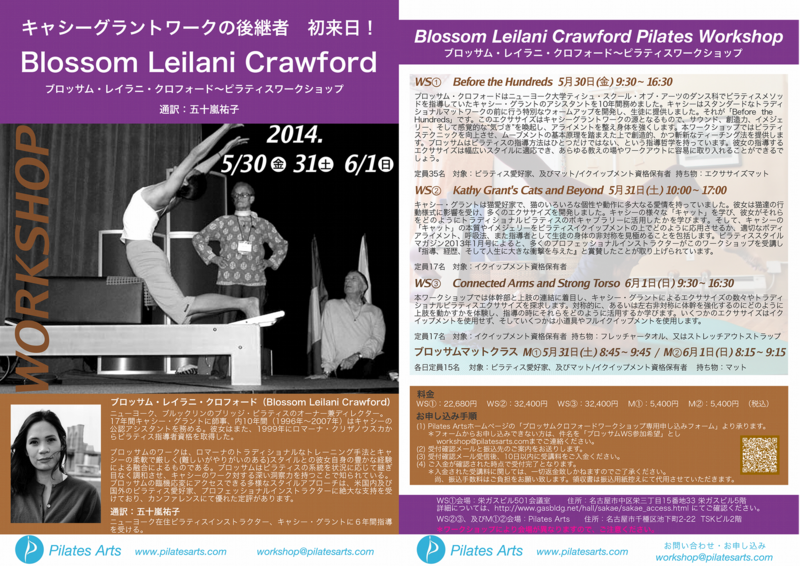 We are very excited to announce that Blossom Leilani Crawford will be teaching Pilates workshops and classes in Japan on May 30 - June 1, 2014. Don't miss the perfect opportunity to study with with Blossom, the protege of Pilates Elder Kathy Grant(1921-2010). I intend to get Yuuko Igarashi to interpret. Scroll down for workshop description. Blossom Crawford assisted Kathy Grant's Pilates Mat class for dancers at New York University for ten years. In that class Kathy developed a vocabulary for the warm up exercises that came before she started the traditional Pilates Matwork. In this curriculum lies the heart of Kathy's work. It incorporates sound, creativity, imagery and sensory awareness in order to strengthen and align the body. Blossom's workshop teaches skills that will enhance Pilates techniques and will provide creative new ways to incorporate fundamental movement principles in teaching practices. The exercises will cover a vast range of styles - a trademark of Blossom's philosophy that there is no one-way to teach　Pilates- these practices are easily assimilated into any teaching situation or workout. Kathy Grant loved cats. She loved their many personalities and the way they moved. Cats inspired her to make up many different exercises. Participants will learn most of Kathy's "cats" and how Kathy used them within the traditional Pilates vocabulary. Blossom will demonstrate how the principals and imagery of Kathy's cats can transfer to skills you want to use on the Pilates equipment. This includes teaching proper body alignment, breath integration and, as an instructor, being able to identify asymmetry within pupil's bodies. In the January 2013 issue of Pilates Style magazine, this workshop was praised by other professional instructors as the one that, "...had the greatest impact on their teaching, their careers and their lives." In this workshop we will explore a collection of exercises from Kathy Grant and traditional Pilates exercises that focuses on the arms attachment to the body. We'll play with ideas on how to use the upper extremities to strengthen the symmetrical, or asymmetrical, torso and learn how to use these tools when teaching. This workshop will have some exercises that require no equipment, and some that require Pilates props and a full line of Pilates machines. Blossom had the good fortune to be introduced to Pilates by Kathy Grant in 1993, during her first year as a dance student at New York University's Tisch School of the Arts. After three years of working with Kathy, Blossom became her Teaching Assistant at NYU, an honoured position that she held for over a decade (1996-2007). She also received her Pilates teaching certification from Pilates Elder Romana Kryzanowska in 1999. Blossom is known for her ability to seamlessly integrate Pilates lineages as the situation demands, and for her insight into Kathy's work. Her versatility, playfulness and powerful teaching methods which she developed during the 17 years she worked with Kathy Grant has made her a sought after Pilates teacher at conferences throughout the United States and internationally. The owner and director of Bridge Pilates in Brooklyn, New York, she is also a proud mother of two children, Gus and Sabine. If you are interested in attending Blossom Leilani Crawford Pilates Workshop, please register early to reserve your spot. Web registration begins at 8:00PM. (Japan Standard Time) on Sunday, March 2, 2014. * Workshop details subject to change without prior notice. 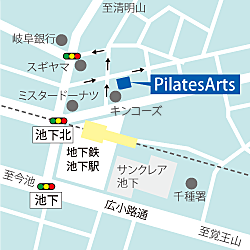 Copyright ©2012 pilatesarts. All Rights Reserved.